Our body is constructed in such a wonderful way that it can be easily bent, turned at various places like the neck, elbows, wrist, fingers, knee, feet etc. This basically becomes possible because of joints (where two bones come together) in our body. the bone ends are covered with a special type of strong, slippery, smooth joint cartilage layer (similar to the stuff earlobes are made of) to act as a cushion. the bone ends are enclosed in a bag called Synovial membrane, that constantly secretes a lubricating fluid to keep the cartilage slippery, and to reduce friction. 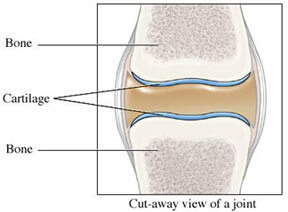 the joint is enclosed in a tough fibrous covering called joint capsule that binds the bones together. It is also lined by the Synovial membrane.